Des Moines, Iowa (CNN) – She's in again. Former Alaska Gov. 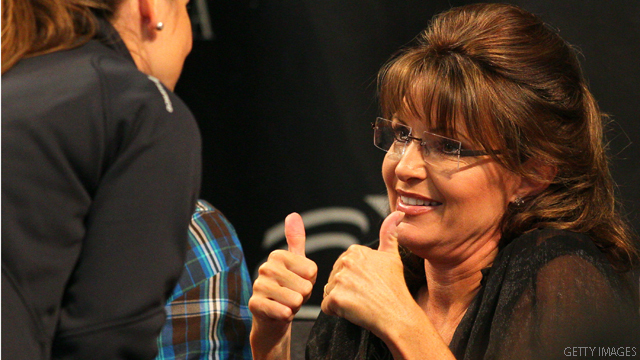 Sarah Palin is set to appear at a tea party rally in Iowa Saturday, a source close to Palin told CNN. And Christine O'Donnell is out (again), the source said. Palin had initially accepted an invitation to speak at the Saturday's "Restoring America Event" in Indianola, an event that generated national buzz as Palin approaches a final decision about whether to run for president. But members of Palin's staff indicated Wednesday that her appearance was being put "on hold" due to "planning issues" and concerns that the group behind the event, Tea Party of America, was being "dishonest" about the speaking program. After the confusion, rally organizers "stepped up their game today" and "sorted out" various logistical issues that had concerned the governor's aides, the Palin source told CNN Wednesday afternoon. The source said event organizers had been sending them "mixed messages" about the program - including the question of whether O'Donnell, the former Delaware Senate candidate whom Palin endorsed in 2010, would participate. O'Donnell was, for the second time in 48 hours, removed from the program Wednesday afternoon. Ken Crow, one of the rally organizers, told the Des Moines Register that he dis-invited O'Donnell at the Palin camp's request. The Palin source said O'Donnell's representatives misled the tea party group about the extent of the governor's relationship with O'Donnell. O'Donnell's representatives told event organizers that she would be in Iowa on the date of the rally and would like to come by and "say hi" to Palin, the source said. O'Donnell was then added to the speaking agenda. The source told CNN that O'Donnell aides lied to organizers and said Palin had been communicating via text message with O'Donnell about the rally. "The governor hasn't spoken to her in a year," the Palin source said of O'Donnell. Palin advisers said earlier Wednesday that Palin might make a separate showing on Friday in Des Moines to meet with supporters, but that appearance is not confirmed. An aide to O'Donnell disputed that people close to her mischaracterized her relationship with Palin to the Iowa rally organizers and asserted they did not lie about the extent of conversations between the two late Wednesday. O'Donnell spokesman Matt Moran said O'Donnell will not travel to Iowa this weekend and sign copies of her book "Troublemaker." After she was initially dis-invited she cancelled her flight. When she was re-invited to the rally organizers offered to pay for her trip. Moran said O'Donnell thought it would be an honor to be at the event and never intended to upstage anyone. “As of this morning we saw a very classy move by Ken Crow, but since then there's been a lot of inconsistent and false statements by organizer-attendee aides, which is unfortunate. Christine talks about 'rising above it' in her book, and we hope the event is a phenomenal success,” Moran said in a statement. In a series of tweets late Wednesday O'Donnell did not criticize the event's organizers. "Now we have to help their efforts by not letting anyone falsely spin this into infighting," she wrote. On some of the accusations from sources close to Palin she responded: "My team did not misrepresent my schedule" and decided to criticize the media. "I really doubt anyone from Palin's team would say such blatant inaccuracies." –CNN's Kevin Bohn contributed to this report. It doesn't matter both of them are IDIOT and UNQUALIFIED to run for any Public office. And the Tea Party Is a Bunch Of CRAP any way. This why they can have all the Dumb and hate spreading and RACIST there all at one time. Remember, these are the people we would trust with codes to launch the world's most powerful nuclear arsenal. They couldn't plan flatulence at a baked bean festival. Sarah: I know you live in a bubble; I do have one question: HOW'S THAT MOVIE THING WORKING OUT FOR YA? And to the producer: if you have another million, I've got a tower in Paris to sell ya. The more she speaks, the more damage she does does to the GOP and TP. She is an embarrassment. Hey, I have a great idea – let's elect an Eighth grader for President of the United States of America !!! How'd did that work out for you, Alaska? lol just another example of the idiot tea party and their queen of mean. The thing that troubles me most is that these teabaggers are continually called Christians. Does a Christian cheat lie and deceive in every possibly way to get their way about things? Are they mean and vindictive to anyone who crosses their path that they don't agree with? Do they make threats with guns, to intimidate others and suggest they aren't really trying to intimidate? They are mean and vindictive bullies who are trying to keep their bosses, the Koch brothers happy so they can roll in the dough and destroy regular folks. These Koch's were the original John Birch society which fell flat on it's behind so they are trying again under a different name, and trying to get the worst bullies to help them. Most of them aren't smart enough to know what they are doing and don't really care as long as they are making money. Wise up people and fight back or we will be living under a dictatorship such as we have been trying to end in the rest of the world. This cluster of Republican presidential candidates is the weirdest collection of oddballs ever. Only Huntsman appears normal and the only one who can win in 2012. The rest are more than happy to run their party off a cliff in 2012. Your comment made my day!!!!!! Too funny! Who cares. She is insignificant. What Tea Partiers need, besides brain transplants, is a schedule planner. Would those sorted logistics include sippy straws? All of this comedy clearly shows that Snooki Palin is coming after Bachmann's money and media attention. Witch ODonnell's flame out on CNN led to her own teabaggers kicking her to the curb. Priceless.